With a changing climate, we need to think beyond traditional or “grey” engineering. “Blue-Green Infrastructure” (BGI), being the interconnected network of natural and semi-natural areas, are vital for building city and landscape resilience in the face of climate threats. In Peru, its components include wetlands, floodplains and ancestral techniques such as amunas, connected with blue and green building elements like green roofs. As a part of an integrated master plan, nature restoration and Blue-Green Infrastructure can be combined with traditional engineering measures. Blue-Green Infrastructure differs from the “grey” infrastructure or traditional engineering due to its natural elements, the network of measures that connect them, and the multiple ecosystem services that they provide. 90% of the world’s disasters are related to excess’ and shortages of water. These are worsened by climate change; effectuating changes in temperature, precipitation, storm frequency and intensity, as well as sea level rise. Adapting to the impacts of climate change and reducing water-related risk, requires a dynamic and adaptable infrastructure. If we merge the dynamic and adaptable properties of natural areas (wetlands) with the semi-natural (linear parks with roads), that are interconnected (with drainage systems and green roof corridors), we end up with Blue-Green Infrastructure. This interconnected network allows the flow of persons, water and biodiversity. Additionally, the disaster risks related to climate change, such as floods, droughts and landslides, could be reduced. At the global level, there is increasing for well-managed Blue-Green Infrastructure is economical, scalable and sustainable. It could even contribute to the grey infrastructure. For example, preserving highland wetlands can contribute to the supply of water to a hydropower dam downstream. In Peru, between November and April, the Andean rainy season, floods are an annually recurring phenomenon. During the first months of 2017, heavy rains caused severe floods and mudslides in rural communities and urban areas of almost the entire national territory (24 of the 25 departments of the country). Even though the rainy season is typically at this time of year, the rain intensity in 2017 and its impacts have been particularly strong. 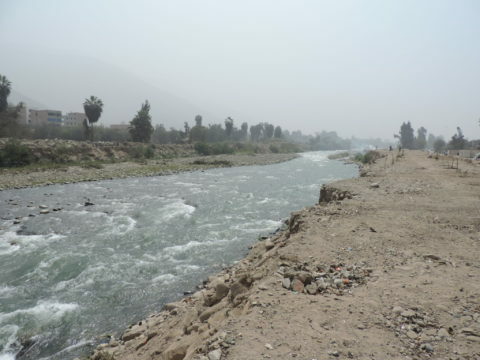 Climate change models show that the likelihood of this type of extreme events will increase more and more in Peru’s watersheds. 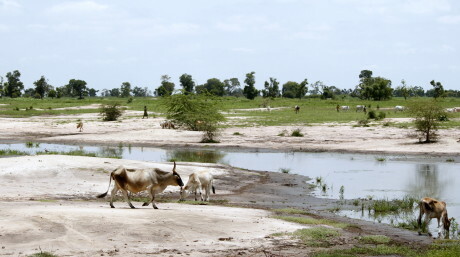 Although the causes of the devastating effects of the rain where many, the environmental degradation in the high, middle and low basin zones play a critical role. Many Andean and coastal ecosystems are being degraded, mainly by anthropogenic activities such as unsuitable agricultural practices like overgrazing, pasture burning or cultivation of steep slopes; and other activities such as mining, organic soil extraction (peat or champa), urbanisation, among others. The deterioration of these ecosystems contributes to the vulnerability of the population of the basin in the face of natural hazards, limits their ability to adapt to climate change and affect their productive activities. This deterioration highlights the importance of Blue-Green Infrastructure, which allows for environmental restoration, maximises ecosystem services and contributes to the well-being of the population throughout watersheds, both in cities and in the countryside. These advantages are evident in the following cases of management of Blue-Green Infrastructure in Peru and abroad. In the high Andean parts of the Peruvian basins, under the snow and glaciers, we find the “bofedales,” they are defined as zones with vegetation of wetlands that can have layers of underlying peat. 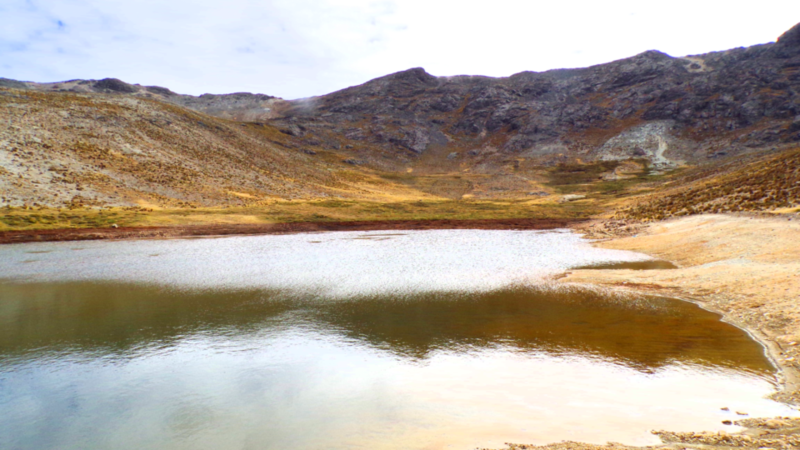 These high Andean wetlands exist above 3,800 meters above sea level and cover a total of 549,360 hectares (about 0.4% of the country) (MINAM, 2012). As large high-level sponges, the bofedales retain and purify water in the upper section of the basins, thus protecting basin populations. Additionally, they are natural traps for sediment retention, improve water quality thanks to their filtering capacity, are important sources of fodder and water for domesticated livestock and are biodiversity centres (Fonkén, 2014). The bofedales are extremely fragile ecosystems due to their characteristics, threats and high socio- economic significance. Over time, bofedales have been affected by human activities including overgrazing, metal mining and peat extraction. For this reason, we propose the recognition of the ecological function of bofedales and their capacity to act as Blue-Green Infrastructure. The restoration of bofedales, as done by Asociación Ecosistemas Andinos – ECOAN, is a big but achievable challenge. 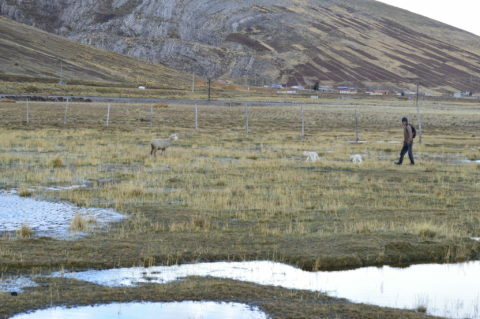 There are between 2,500 and 3,000 hectares of bofedales to be urgently restored in the Chillón, Rímac, Lurín and Yauyos basins and many more in the other Peruvian basins. 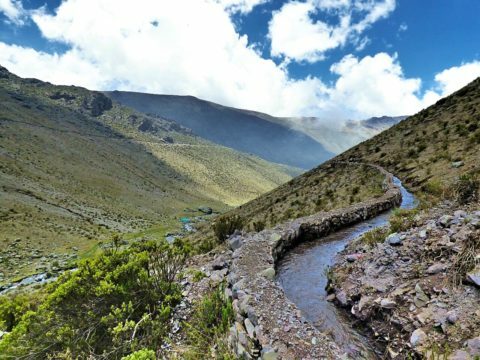 An a(y)muna is an ancestral infrastructure system that captures water from small rivers and streams, through channels that built on the slopes of mountains using local materials found in the Andean mountains, such as fractured rocks, earth, clay, sand (Apaza, Arroyo & Alencastre, 2006). The only cost is labor and maintenance that can be easily carried out by the community. The amunas have the purpose of distributing and harvesting water. They facilitate superficial and underground water recharge, ensuring the availability of water throughout the year. This technique was developed by pre-Inca engineers as part of a comprehensive water management system. In the mountains of the Andes, most of the ground is covered by fractured rocks that also have low permeability and are the primary materials for the construction of amunas. With more prolonged droughts caused by climate change, the amunas represent a lifeline for peasant populations in the highlands while also contributing to the water supply of dams downstream. The potential of this Blue-Green Infrastructure is illustrated by the 135 km of amunas in the Chillón, Rimac and Lurin river basins that fall within the scope of work of the expert organization AquaFondo. The application of Blue-Green infrastructure, such as the amunas, in the basins, would benefit the upper basin zone by capturing an additional 6.7m3/s of rainfall; and a minimum of 1.4m3/s in Metropolitan Lima (World Bank Report). We still face the challenge of making a national inventory of amunas, their conservation status and restoration possibilities. In the main densely populated cities, there are often established settlements in the marginal strip of rivers. These are in fact, floodplains. As such, infrastructure and people present in such areas are susceptible to flooding. Conventional engineering approaches or “grey” practice would be to channel the river to protect the banks. However, this leads to faster discharge of excess water, increasing the risk of lower basin flooding. On the other hand, the natural Blue-Green Infrastructure of floodplains can retard runoff due to their ability to temporarily store water (filling up and expanding the river); and lower the velocity of the river channel, thus controlling erosion. This means that, instead of limiting the river, you must give it the space to grow and shrink. Within cities, floodplains can be integrated as linear parks and recreational areas, as demonstrated by the “Room for the River” program in the Netherlands. This program increased the surface area of the flood plains of the Waal River, to maintain flow at safe levels, using climate change predictions. It is worth mentioning that the river margins now double up as spaces for recreation, sports and cultural events during the times of the year with low and medium flow. In this way, restoration of floodplains has multiple co-benefits, in addition to regulating the water. To connect the bofedales and amunas, with floodplains along the basin, from the rural area to the city, one can incorporate them with other complementary measures. For example, along the basin, from the mountains to the coastal cities, the vegetation cover should be improved. Natural vegetation has the capacity to store and buffer part of the volume of water precipitated by plant interception and increasing evapotranspiration. In this way, vegetation can reduce the speed of surface runoff through a river basin. To prevent mass movements (erosion) generated by heavy rains, work can be done to control soil erosion. This can be achieved by reforestation, the creation of small reservoirs, shore stabilization and correct agricultural practice. Reforestation in Peru may be done with native species which, unlike acacias, pines and eucalyptus), also generate economic benefits and help revitalise the soil, such as Polylepis spp. (upper part of the basin), Escallonia spp, Buddleja spp, Schinus spp, Tara and others (lower altitudes). Within cities, there are several semi-natural complementary measures possible, especially if connected with natural areas. An example of such a measure is a green roof network, which, doesn’t only harvest water and reduce runoff; it also forms small habitats for urban biodiversity. Another measure is the creation of urban creeks or drainage ditches with vegetation cover (bioswale, illustration 6), with an even more significant benefit if they are connected to either wetlands with a natural reservoir function or built reservoirs. Artificial wetlands can serve an additional sanitation function if populated with plants whose roots and bacteria can purify gray water from human settlements. Complementary measures of a bioswale – photo Marlo Paris (left) – and artificial wetland and green wall – photo Deltares (right). To some, building a Blue-Green Infrastructure in Peru seems like a dream. But, by uniting engineers, hydrologists, architects, environmentalists, biologists, rural and urban communities (rural and urban), mobilizing sources of funding and creating political will; around an integrated master plan for a watershed or landscape, it is possible. We are convinced that in the face of climate change the response has to be on a large scale, joining forces and going beyond different sectors. Our call? Let us together build the Blue-Green Infrastructure necessary to make Peru adaptable to the extremes of a changing climate and let all Peruvians benefit from the services these provide. 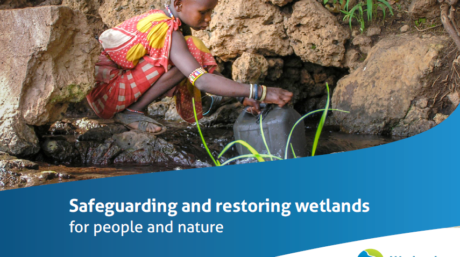 Keywords: infrastructure, wetlands, basins, water, disaster, climate change, adaptation, network, measures, design, ecosystems, restoration, drought, flood, communities.